Free Sicilian salad from Italianni’s, P99 solo meals at Super Bowl, P188 breakfast meals at Cravings plus more steals and deals. 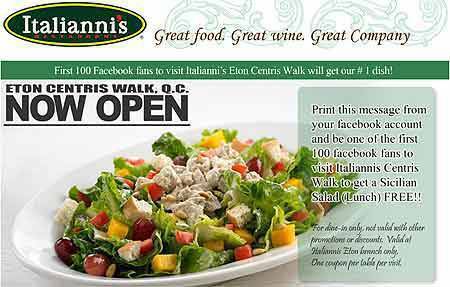 Italianni’s Philippines celebrates a new branch at the Centris Walk, Eton Center, Quezon City by giving out a FREE Sicilian Salad to the first 100 Facebook fans who visit the branch. Check out the Italianni’s Facebook Page and print out the message posted on the fan page to get your free Sicilian Salad. 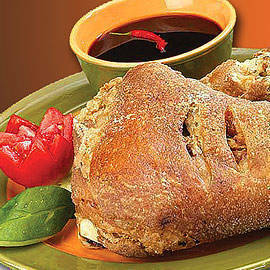 Italianni’s is at the Centris Walk, Eton Center, EDSA corner Quezon Avenue, Quezon City. 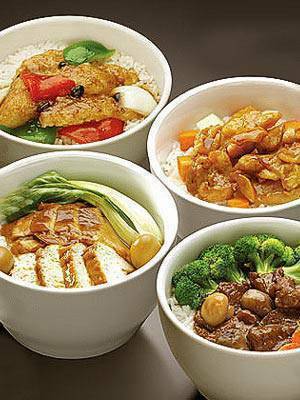 Enjoy filling meals on a budget at Super Bowl with the P99 solo meals: Fish Fillet with Tausi Sauce, Diced Chicken with Oyster sauce, Roast Pork with Beancurd and Beef with Broccoli. Available at all Super Bowl branches. Dubbed as the world’s first cheese café, Café 5845 is venture between the Magsaysay Center for Hospitality and Culinary Arts (MIHCA) and Kraft Eden Cheese. Located at the SM Mall of Asia, the cafe has a menu with hearty dishes all made with cheese, and priced under P150. Choose from their pasta picks, main entrees, and snacks: Penne Amatriciana with Shrimp & Mushroom (P100), BBQ Pork w/ Cheesy Bechamel Sauce (P125), Fish Cordon Bleu (P150) and Shrimp Asparagus with Bacon Cheese Gravy (P150). 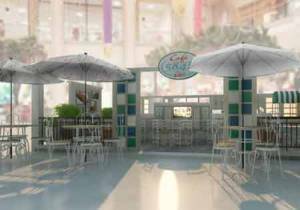 Café 5845 is at the Ground Floor, North Living Seaside Boulevard area, SM Mall of Asia, Bay City, Pasay City. Start the day with breakfast meals at cravings for only P188. 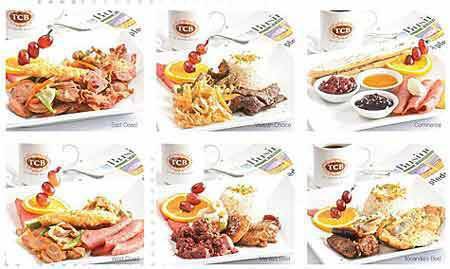 Choose from the East Coast Platter, with sausages with onions, crispy bacon, hash brown, sautéed mushroom and tomatoes, and fruit medley; the Continental Breakfast with ham and cheese, bagel and French toast with your choice of blueberry or cranberry syrup plus fruit medley; the West Coast meal with chicken Franks with bell peppers, pineapple glazed ham, hash brown, sautéed mushroom and tomatoes, and a fruit platter; the European Comfort with pancake, sausages, and served with fruit medley; Manila’s Best, a hearty meal of chicken tocino and corned beef served on garlic rice with ensalada and fruit medley; the Visayan Choice with beef tapa, a choice of either fried dilis or danggit, steamed or garlic rice, and ensalada plus fruit medley; and the Ilocandia’s Plate with garlic longganisa, daing na bangus, your choice of rice and savory ensalada and fruit medley. Mornings at Cravings is available from 7 to 10 a.m. at Cravings Center Katipunan, Quezon City. Tel. Nos. 426-6681, 426-6567. From 6 to 8 p.m. every Monday, drink all the margaritas you want for only P250. 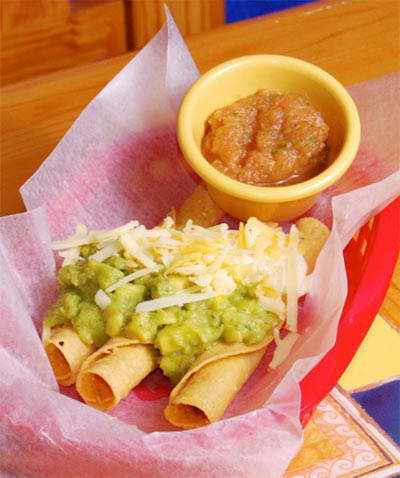 Pair them with Baja Mexican Cantina’s taquitos, tacos and burritos. Baja Mexican Cantina is at 3rd Floor Greenbelt 3, Ayala Center, Makati City. Tel. No. 756-0127. 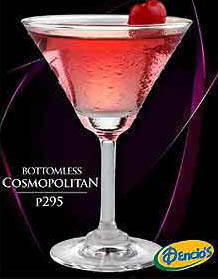 Drink all the frozen margarita, cosmopolitan and mojito you want at Dencio’s for only P295. Pair your favorite cocktails with bar chow such as Macho Nachos (tomato and cheese nachos made more flavorful with ground meat or just plain tomato and cheese nachos), slim cheese wraps, or vegetable nibbles (slices of carrots, cucumbers and singkamas served with dip and crunchy bits). Promo is available at the following branches: TriNoma, Metrowalk, Eastwood, Scout Albano Quezon City, Brittany & CCP branches. 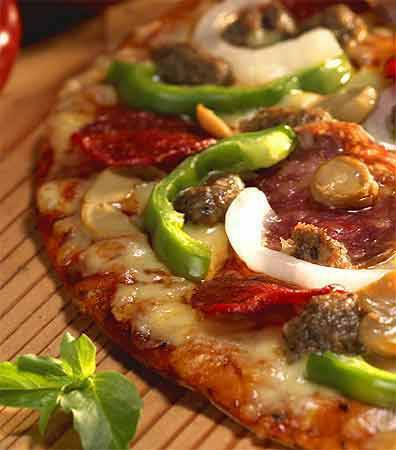 If your idea of a favorite meal is a pizza party, get the Pizzanatic SuperCard from Shakey’s for only P299. Get deals like the buy-1-take-1 pizza offer plus the Shakey’s Pizzanatic SuperCard also acts as a discount card and earns points for every purchase at Shakey’s. Available at all Shakey’s branches. 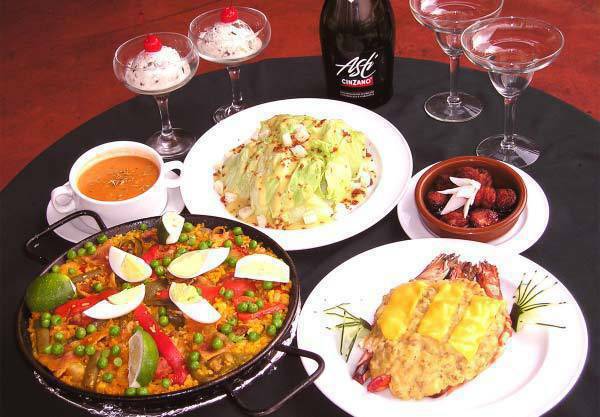 Available for lunch on Saturdays and Sundays, Casa Armas’ sumptuous Spanish weekend buffet calls for endless paella, conchillo and your favorite tapas, all for P599 per person at the Trinoma branch. The weekend buffet is available at the Trinoma branch of Casa Armas, located at the 3rd level TriNoma Mall, Quezon City with telephone number 900-0449. Casa Armas is open from 11 a.m. to 10 p.m.
Indulge on a weekend with Sala Bistro’s weekend brunch for only P690+. Choose from poached eggs, The Bistro minute steak, Omelette Florentine, Croque madame and a selection of puddings and pay only P690 for a two-course brunch or upgrade to get unlimited pours of bubbly wine for only P1,280. 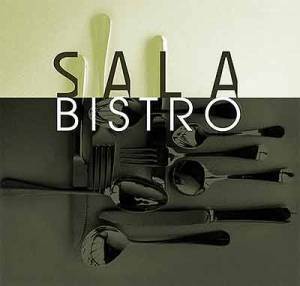 The Sala Bistro weekend brunch is available on Saturdays and Sundays from 11 a.m. to 2 p.m.
Sala Bistro is at the G/ F Garden side, Greenbelt 3, Ayala Center, Makati. Tel. No. 729-4888. 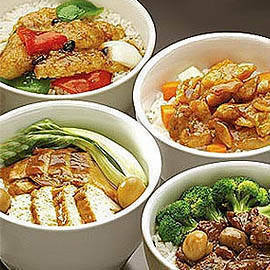 Pepato in Greenbelt 2 will be saying its farewell via a food festival serving Pepato’s memorable dishes until August 15. Head to Pepato to enjoy your favorite dishes such as Crepe millefoglie, Spaghetti Pepato, Florentina Style Bistecca, and Chilean Sea Bass. Pepato is at Greenbelt 2, Ayala Center Makati City 757-2636. Photographs from cravingsgroup.com, Gaita Fores (Pepato), shakeyspizza.ph (Shakey’s), Baja Mexican Cantina.